If you’re new to acrylics they can be tough to learn at first. This fast-drying medium is not as friendly to beginners who dive in head-first. And it’s a lot different than oil painting so a guide is always helpful. But we can’t always have a teacher over our shoulder. That’s why books are so useful. They condense expert advice into the printed word and cover a huge variety of topics. So in this post I’ve curated my top picks for the best books on acrylic painting. Whether you’re a complete newbie with acrylics or just looking to increase your existing skills there is plenty here to pick from. Let’s start with a truly incredible guide to the world of acrylics. Painting in Acrylics: The Indispensable Guide by Lorena Kloosterboer is probably one of the best resources to help you get started. This book covers everything on how acrylic paint works, its advantages & disadvantages, plus how to use additives to improve your workflow. There’s even a whole chapter on the materials and supplies necessary to get started with acrylic work. So even if you’ve never touched a paintbrush before this book can help you get moving right from the beginning. Note it does help if you’re already familiar with the fundamentals of drawing before getting into any type of painting. But you don’t really need prior painting experience to work with acrylics. Yes it helps, but even a newbie can get up & running with this amazing guide. Here’s another massive book on acrylic paint, yet this one’s at a slightly higher teaching level. 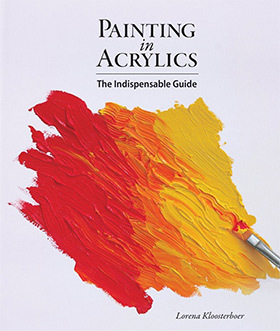 Or rather, this book is fantastic both for beginners and even more experienced painters. 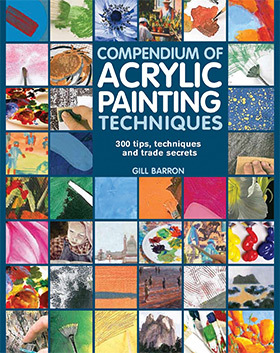 The Compendium of Acrylic Painting Techniques by Gill Barron totals 170+ pages with some really practical tips for getting your acrylic work moving. You’ll start by learning how acrylics work and why you should use them. But you’ll quickly move into more detailed topics like picking your color palette, finding the right brushes, and learning how to get into a regular workflow. The materials you can use with acrylics vary widely with knives and sponges along with shaping tools. Naturally this book covers it all along with exercises to help you learn. It’s a great book for beginners since it covers a lot of foundational knowledge. But there’s also plenty of advanced techniques that Barron shares between these pages. I don’t often see this book mentioned in painting circles but I still think it’s one of the best since you can keep coming back to it for years. 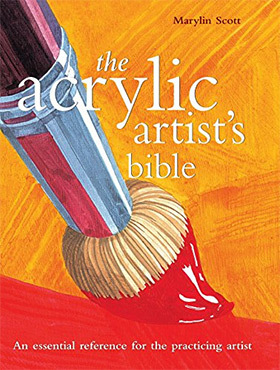 The Acrylic Artist’s Bible written by Marylin Scott offers a handy reference guide to the entire painting process. You’ll learn about pigments, types of acrylic paints, mixing colors, blending, working with dry brush and so much more. The chapters even break up into beginner topics and more advanced techniques later in the book. With this on your bookshelf(or in your Kindle) it’ll prove useful as a painting reference for years and years. The best part is the contents grow with your skills making this a true bible for artists. I’m a big proponent of starting small and building with momentum over time. So if you’re brand new to acrylics you may get discouraged. A lot. 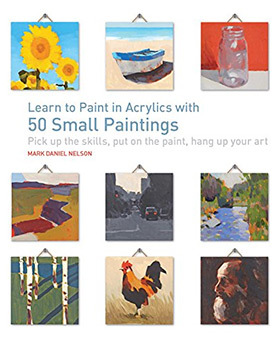 But you can start off with an easier learning process by grabbing Mark Daniel Nelson’s Learn to Paint in Acrylics With 50 Small Paintings. This is truly a unique self-teaching book for any artist diving into acrylic paints for the first time. The book spans a total of 50 small painting exercises that you can work through and practice over the series of weeks or months. You can even go back to re-do certain lessons that you don’t feel comfortable with. And through this process you’ll learn so much about acrylics. This should be mandatory reading for anyone who’s never used the medium before. Artist Lee Hammond has written dozens of great books on topics like drawing animals, portraits, and scenery. But this is one of her best titles that isn’t focused on anything too specific beyond acrylic painting. 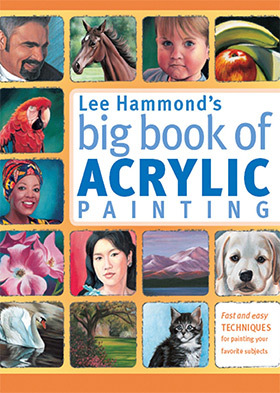 Inside Lee Hammond’s Big Book of Acrylic Painting you’ll find almost 200 pages packed full of practical exercises, live examples, and step-by-step walkthroughs for various projects. In fact the book comes with over 80 exercises all with a different end goal and subject matter. Yet the result is always the same: improving your skills in acrylics. You’ll start with a supplies list along with basic topics for beginners. However the chapters quickly pick up speed with tips on selecting colors, brush techniques, working with still lifes and moving onto the more technical subjects. Hammond’s work is brilliant and her writing is so easy to follow. 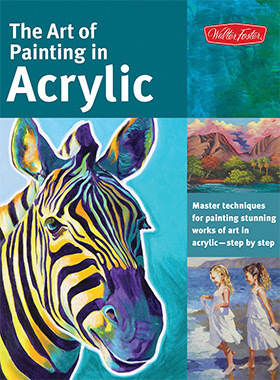 If you’re looking for a step-by-step tutorial book on acrylic painting this is the one you want. Once you feel comfortable working with the basics you may try varying brushes in your work. And that’s where the book Brush with Acrylics comes in handy. This 128-page primer to different brush styles and brush techniques will leave a lasting impression on your workflow. I mostly recommend this for mid-level painters who already feel comfortable in acrylics. You can pick this up as a beginner and try working through the chapters, but the language may be a little over your head(at first). Still, the techniques are invaluable covering detailed topics like pottery brushes and Terry Harrison’s so-called “sword brush” which are unique to the world of acrylic. Here’s one of the newer books in my list and it’s also one of the best titles for more advanced artists. 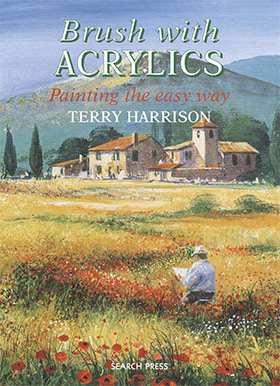 In Secrets of Acrylic by Jerry Yarnell you’ll find real-world practical advice for painting landscapes. The entire book is focused solely on landscapes so this would be perfect for traditional painters with a love of the outdoors. Yarnell shares a lot of advice on problem solving and how to approach individual studies with an intent to learn. You’ll also see how Yarnell solves more complex problems in his acrylic paintings. Pretty nice book with solid advice, although very specific to landscape work. Inside The Art of Painting in Acrylic you’ll find advice from dozens of artists who all have a strong background with acrylic paint. The book offers a bunch of practical techniques, mostly aimed towards beginners, but all of which you can put into action in your own work. Early chapters get into details about the materials necessary for great acrylic work along with how you should approach the blank canvas before laying down any marks. But the most valuable advice here relates to texturing and learning to create purposeful brush strokes. This can take a lot of practice to master but once it’s second nature you’ll feel a lot more creative & free working with this medium. I don’t do abstract art myself but I know many artists love it. 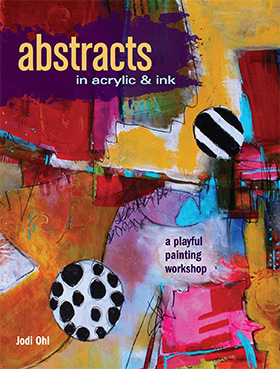 So while I can’t say this book is perfect for everyone, it is a brilliant way to get into doing abstract pieces. Abstracts In Acrylic And Ink mixes two mediums together with some very practical advice for newer artists. The author Jodi Ohl shares her thoughts on abstract work and how she approaches her own projects. Inside the book you’ll find 22 step-by-step exercises to follow and learn as you go. Each one can help you learn how to manipulate paint, work with ink, mix with primers and varnish, or how to complete your pieces so they fit with your envisioned goal. A superb book for anyone seriously curious about abstract work. I don’t like to recommend overly-specific art books, however this one is hard to pass up. 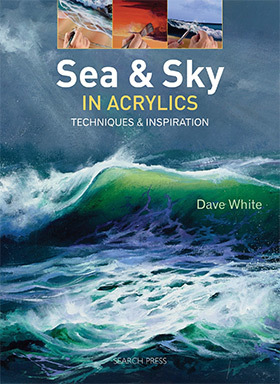 Sea & Sky in Acrylics by Dave White is incredibly well written and so easy to follow. Not to mention it covers two topics that are difficult to master and difficult to work directly from life. Each chapter shares different techniques for things like clouds, waves, and varying colors you’ll find in the sky based on weather changes. You can use this to help improve your imaginative work and to help you paint clearer pieces working from reference photos. 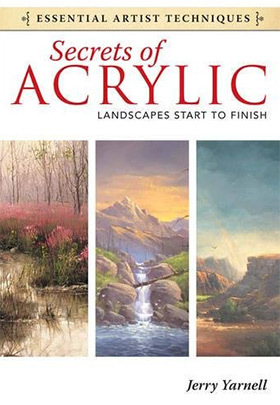 Overall just one heck of an instructional book on acrylics for environments. This is the newest book in my entire list and it certainly deserves some praise for the writing style alone. Author Annie O’Brien Gonzales wrote The Joy of Acrylic Painting as a guide for beginners who may not fully understand how to approach acrylic work. Early chapters cover materials and the basic setup for painting, so if you are completely new this guide will help you start on the right path. As you progress through the book you’ll find some lively and engaging practice ideas to push you outside your comfort zone. These aim to improve your knowledge of color selection, brush work, and even mixed media work. Ironically this book is incredible for beginners & experts alike. 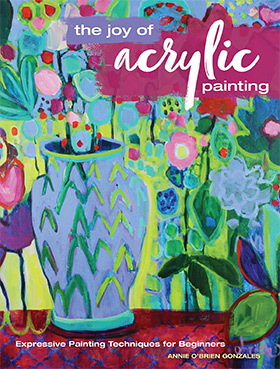 It’s an easy-to-read intro for beginners since it makes acrylic painting so approachable. Yet it’s also brilliant for experienced artists who want to push themselves further with acrylics. This is one of the few titles that, regardless of your artistic background, can really help to improve your knowledge and confidence working with the medium.